David Robertson’s Dump anthology is one of those refreshingly old school small press publications that embody the DIY culture of self-publishing with an unashamedly eclectic collection of shorts. 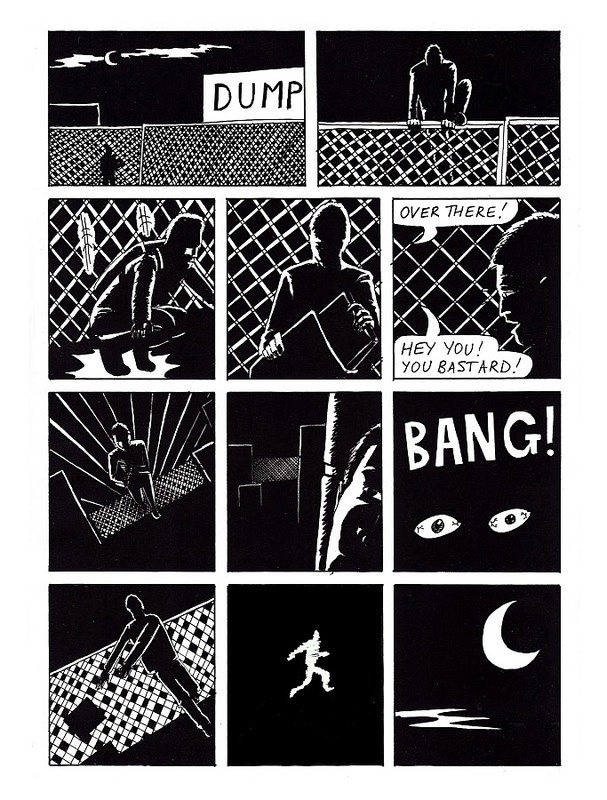 Published under Robertson’s Fred Egg Comics imprint this second issue diverges from its predecessor in that, apart from Robertson’s own work, it also contains a number of one-page autobio vignette strips that give its guiding light the opportunity to work with a number of other artists; all of whom have their own very distinctive approaches to the comics page. The main story – the titular ‘Dump’ – is a continuation from the previous issue and, perhaps strangely in the circumstances, is probably the least interesting offering here. 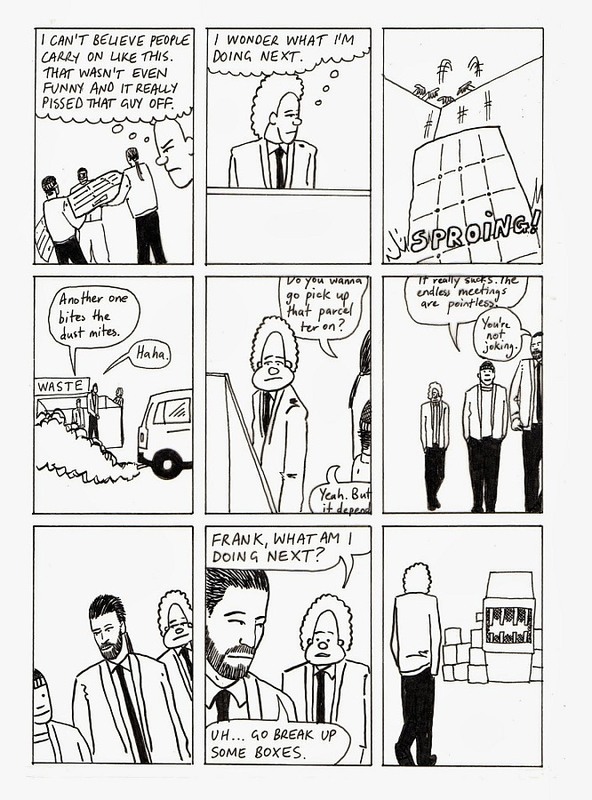 Its protagonist Bert – a more obviously caricatured character within a world of largely realistically depicted players – is slowly learning the ropes of his new employment in a waste management plant. Amid the humdrum tedium of the pedestrian working day, unexpected intrigue enters the lives of the dump workers when one of them discovers a laptop that just may hold information vital to national security. The main problem I had with ‘Dump’ was that it seems unsure exactly what its premise is. Sometimes it’s apparently a Clerks-style slacker slice-of-lifer and at other points a conspiracy thriller but it never really succeeds in merging the two into a coherent whole. Of more note are the aforementioned one-pagers where five different artists team up with Robertson. Two strips in particular stand out. 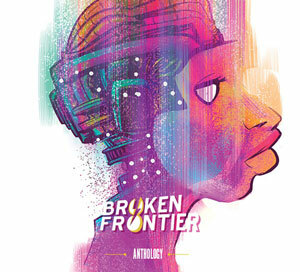 The first of these is ‘Dream of Being You’, a collaboration with Stephen Boyd. In the endnotes to the issue Robertson reveals that Boyd’s art to this piece already existed and he subsequently added text around it to create a narrative. A simple strip depicting a rain swept street, and a contented dreamer cosily asleep in bed within one of its houses, becomes something far more nuanced here with the writer’s reflective thoughts on the plight of the homeless added to it. Similarly ‘Yay! Party!’ (below) with art by Keara Stewart, focusing on anxiety in social situations, works so well because it’s an instantly recognisable scenario and Stewart’s loose style evocatively captures that sensation of panic we feel when we believe we have lost control of events. The Donna Law illustrated ‘Coleslaw’ – an odd ode to mayonnaise-smothered vegetables – is also fun in its juxtaposition of the timelessness of the inconsequential and the finite nature of human existence. 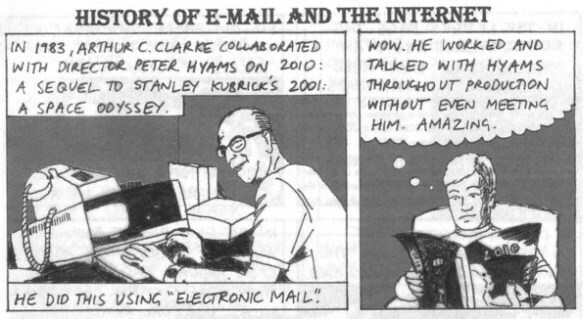 The second half of the issue is made up of the four-pager ‘History of E-Mail and the Internet’ (below) and his 24-hour comic ‘Everything’. The former is a thought-provoking encapsulation of the quantum leap in information dissemination over the last two decade; a neat précis of developments in that arena but one that’s quite text heavy and perhaps could have done with being given a little more room to breathe. 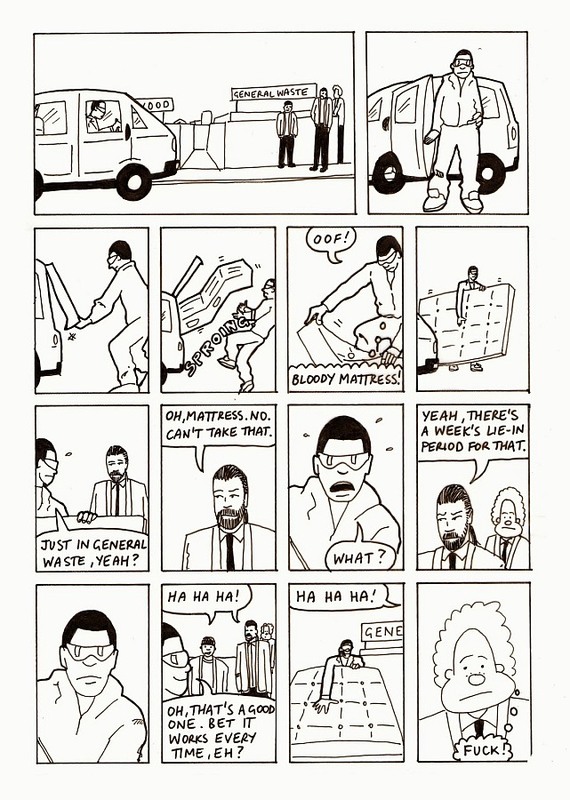 If there was one strip that really connected with me in Dump #2, though, it’s ‘Everything’. 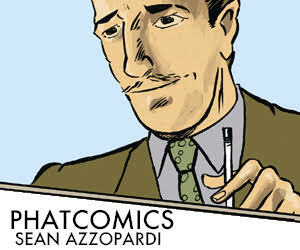 I always find it a little churlish when art on 24-hour comics is criticised because the very nature of the exercise means the work will be raw and unsophisticated. From that statement you can obviously take away a sense that the visuals here are not that polished but for a spontaneous piece of storytelling there are still some inventive touches in these pages. 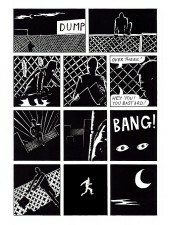 Robertson approached the concept of the 24-hour comic with a pure vision, determined to come to the project without a prepared topical objective. While Dump is, admittedly, often unrefined in technical presentation it does represent a section of grassroots comics that I am always happy to showcase in ‘Small Pressganged’. As long as the work on offer has something worth saying then that sense of democracy that surrounds self-publishing will be deservedly celebrated here. After all, as Robertson displays with gusto here, the opportunities for getting out there and simply creating your own comics for the sake of it have never been greater. 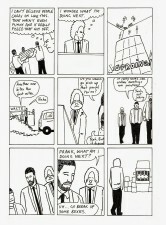 For more on David Robertson’s Dump and Fred Egg Comics check out his blog here. 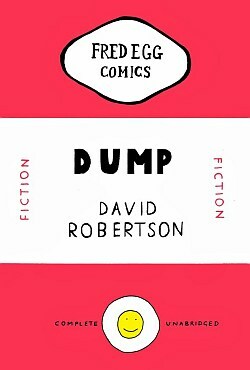 You can order copies of Dump here priced £1.00.